The structure’s monolithic warehouse-esque volume was created by stacking two overlapping containers on top of each other, at various lengths. 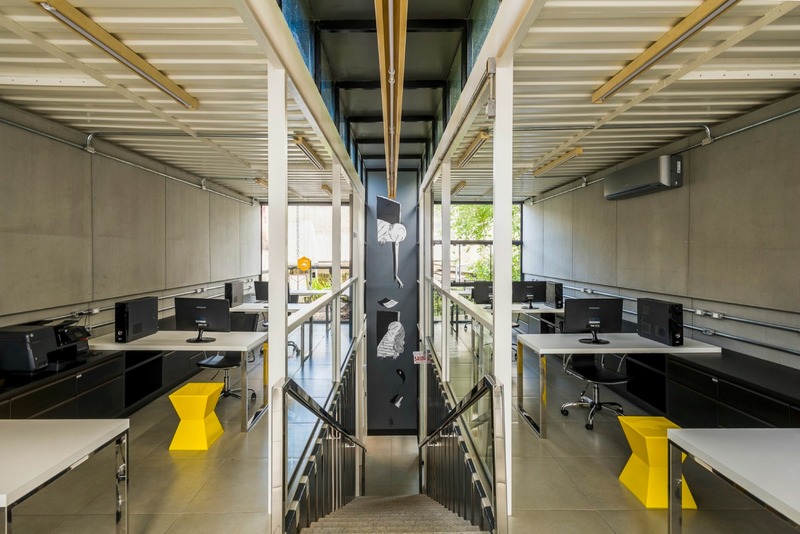 The entrance is located under a cantilevered block, with the co-working spaces primarily located on the upper floors. This was a strategic measure to optimize the amount of natural light on the interior space, subsequently reducing the building’s reliance on artificial lighting. The containers are topped with two large garden roofs, which were installed for their ability to reduce solar radiation and capture reusable rainwater. Additionally, the architects wanted to create a green connection of “urban gentleness” with the neighboring buildings. The design strategy not only called for using the repurposed building material as the main envelope for the building, but also to serve as a focal point on the interior. 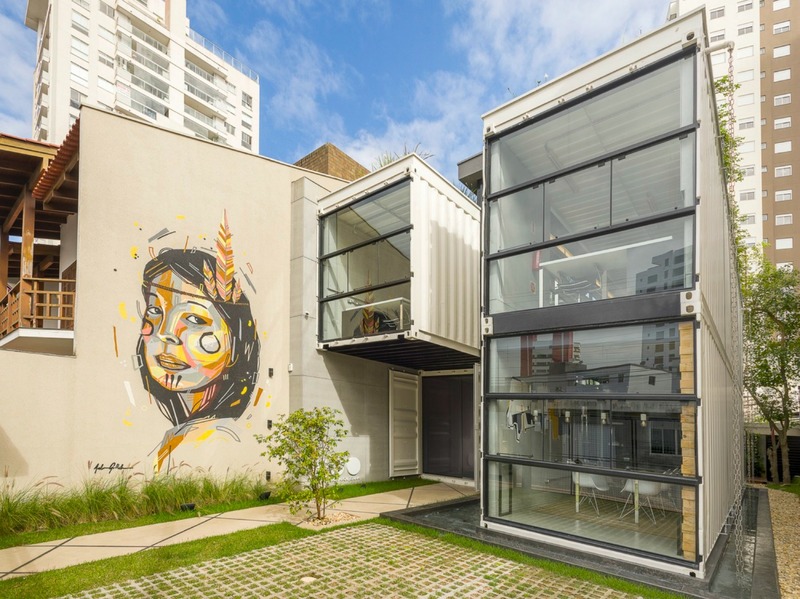 Similar projects typically tend to hide the containers’ rather cold aesthetic, but the designers instead chose to highlight the industrial aesthetic by painting the interior a soothing white. 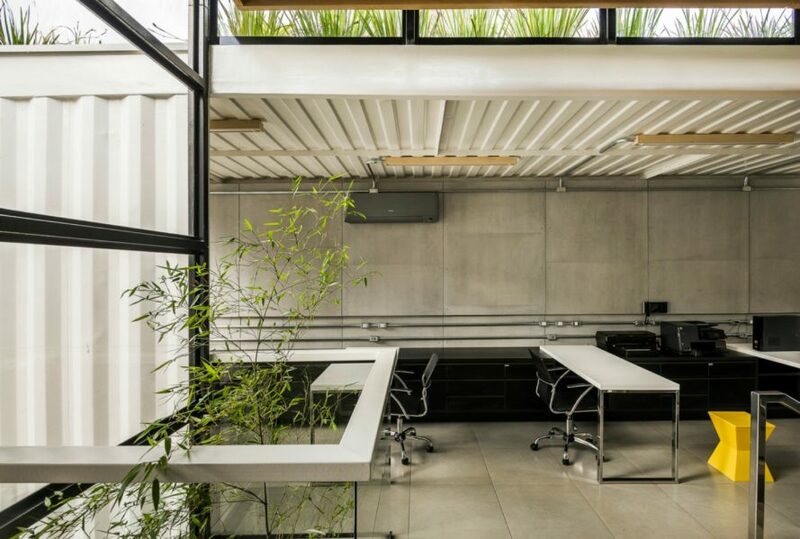 Building on the Container’s philosophy that “being is more important than having”, the space is open and uncluttered, and emits a quiet creative serenity. Focusing more on sustainability and local respect than decoration, the walls are free from art or additional clutter. The only marking is the Container logo, which pays homage to the architect’s indigenous origin and connection with his native city of Itajaí. The practice of building with shipping containers has been growing by leaps and bounds over the last few years, and today's designs continue to push the architectural envelope. 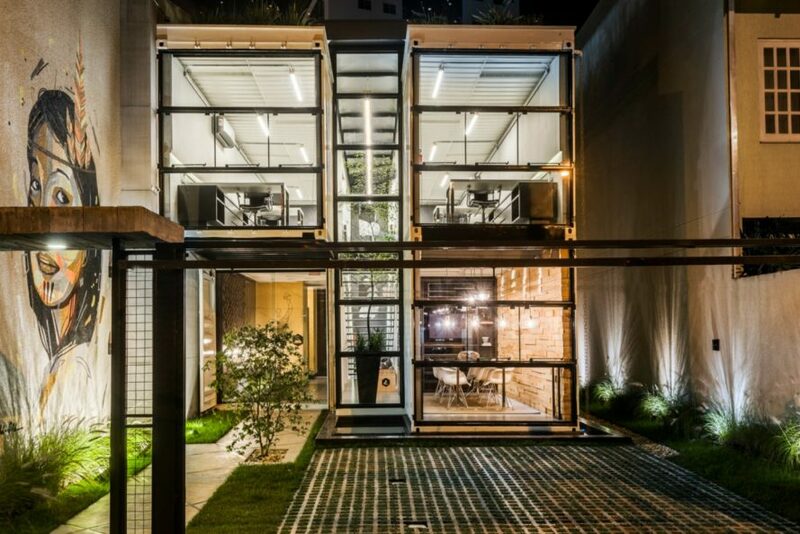 Container by Brazil-based Rodrigo Kirck Arquitetura uses the repurposed material to not only create a stunning coworking space, but also to pay homage to the architect's native port city of Itajaí. The structure's monolithic warehouse-esque volume was created by stacking two overlapping containers on top of each other, at various lengths. The entrance is located under a cantilevered block, with the cowoking spaces primarily located on the upper floors. Putting the community working spaces on the top floor was a strategic measure to optimize the amount of natural light on the interior space, subsequently reducing the building's reliance of artificial lighting. Wooden highlights blend in nicely with the mimimalistic interior. The containers are topped with two large garden roofs, which were installed for their ability to reduce solar radiation, and capture reusable rainwater. The design strategy not only called for using the containers as the main envelope for the building, but serves as a focal point on the interior. Painted a soothing white, the interior design builds on the idea sustainability and local respect. Building on the Container's motto that "being is more important than having", the space is open and uncluttered, and emits a quiet creative serenity. There are few painting or decorative features, just the Container logo, which pays homage to the architect's indigenous origin and connection with the his native city of Itajaí. 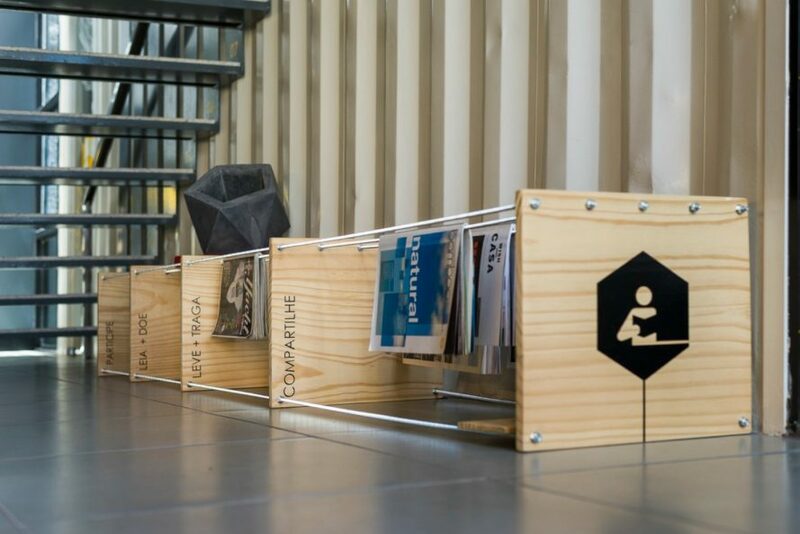 The Container is a coworking space that emits a soothing, environment for creatives.